I’ve been looking at the question of why discontinuous innovations can’t be analyzed successfully. In earlier posts, I suggested that the earlier phases of the technology adoption lifecycle, each lane in the bowling ally, were characterized by Poisson distribution, which over the lifecycle converges to the normal distribution. I’ve seen accounting data showing this. But, that’s probability distributions and machine learning, again something I’ve talked about before. There is a corresponding geometry for the technology adoption lifecycle. It begins sparsely in a hyperbolic space. That hyperbolic space cannot be projected to a linear analysis. Over time this space converges to Euclidean, aka the linear analysis. Then, with the move from six sigma to thirty-six sigma, the normal gets wider, but shorter, since the probabilities still do not add up to more than one. In terms of space, however, the space goes spherical, as in information overload, which allows us to project to the linear in numerous ways. These numerous linear projections enable growth, numerous pathways to growth. I also discussed how to draw curves based on correspondences of axes in some prior posts. I applied this idea to strategy alignment. It turns out that these curves illuminate the underlying geometries. So lets see what the heck happened. For these curves we draw a line from 9 on the x-axis to 9 on the y-axis, from 8 to 8, and so on. This gives us a curve (black). 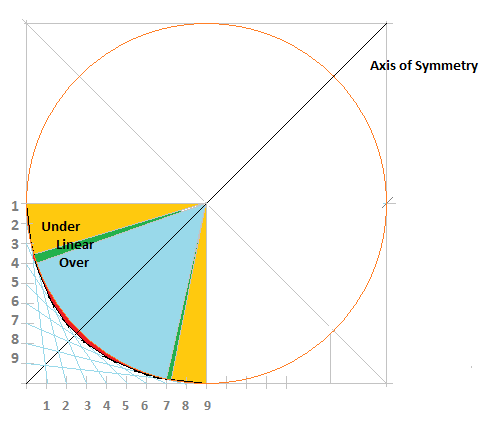 Then, we draw a circle (orange), which represents the Euclidean, aka the linear analysis world. The black line appears inside, on, and outside the orange circle. Inside (under) is hyperbolic. On (linear) is Euclidean. Outside (over) is spherical. The relevant spaces are colored: yellow for hyperbolic, aka caution; green for linear, aka thoughtless; and light blue for spherical, aka overly linear. The core idea here is to know where trouble will turn up in your analysis. Hyperbolic spaces are difficult, because you are stuck on one of Einstein’s world lines. cannot move freely in the space. Spherical spaces are likewise difficult, because your projected linearity could easily be wrong. For strategy alignment purposes, we will use out black line in this figure to be our baseline. 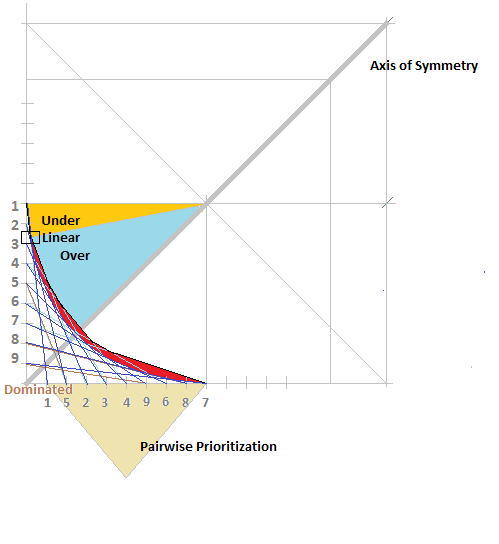 We will consider that the numbers on the axis reflect some pairwise prioritization. Each organization contributing to an axis would have their own order. 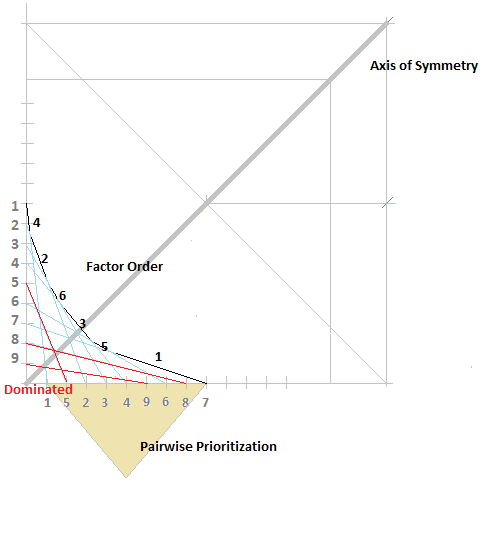 That order changes the curve to reflect that organization’s aggregate prioritization. Those orders contribute to the curve we will draw. Then, we will look at their curve relative to the baseline curve. Their curve should reflect their factor analysis. Likewise, the baseline would reflect the factor analysis of the entire organization. I’ve ordered the factors here relative to their length. In general, factors are ordered by length and angle. Factors describe a curve. Notice that some of the lines that built our baseline curve are not making any contribution to the curve. These lines represent irrelevancies, or in game-theory speak, dominated strategies. Since some of the lines are not making any contribution to the curve, the shape of the contributing organization’s curve will be different from the baseline. The gaps between the factor lines represent the intersections of the factors. With better tools they should be points. Then, the length of the factors should accurately reflect the results of a factor analysis. We can compare the contributing organization’s curve to the baseline curve. Here we drew the baseline curve based on the dark blue lines. The baseline curve is shown in black with red showing us the gaps in the alignments of these organizations. The axis of symmetry is a managerial control that is defined for the rectangle representing the world. Management can move it. The axis of symmetry here is shown for the baseline curve. Notice in this last graph, the system is only linear at a single point. The dominated strategies are shown in brown. A graph can be drawn for each contributor. Those can be compared to the baseline. This will give you a 3D view of your organization or value chain. The collection of curves will give you a surface and expose much in terms of those dominated strategies. The war between marketing and sales is about dominated strategies, or the tension between demand generation and demand creation. Keep these geometries in mind when throwing around those linear forecasts. You are currently browsing the Product Strategist blog archives for June, 2014.